Tristram Hunt MP, Labour’s Shadow Secretary of State for Education, joined me on a visit to Sri Guru Singh Sabha Gurdwara in Hounslow on April 14, to discuss the importance of Punjabi GCSE’s and A Level’s. Exam boards recently published plans to drop languages in several foreign languages, including Punjabi, Gujarati, Polish, Bengali, Turkish and Portuguese. The announcement has caused great concern in many communities, including in Hounslow. Tristram and I met with members of the leadership at the Gurdwara, including Mr Jagtar Singh Tethi, General Secretary, Mr Gurmit Singh Hanzara, Assistant General Secretary, and Mr Hardeep Singh Walia, Assistant General Secretary, as well as several patrons. We heard first hand the importance of Punjabi GCSE’s and A Levels to the local Punjabi community, and the need for a solution to be found. I have heard from the Gurdwara that they were devastated when the plans to drop these languages were announced. 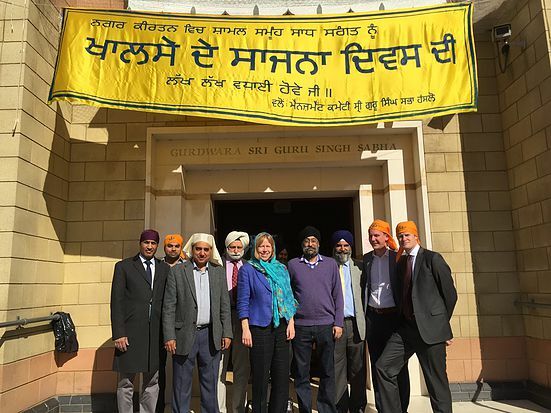 We have a vibrant Punjabi community in Hounslow, and they contribute so much. They teach Punjabi classes so the next generation does not loose touch with their culture. Keeping these languages are not just important to their individual communities, but to our whole country. We are competing in a globalised economy, and we should be encouraging our children to learn a range of languages.